Events — Micallef Cigars, LLC. Are you a cigar and spirits enthusiast? Well we've got what you've all been waiting for! 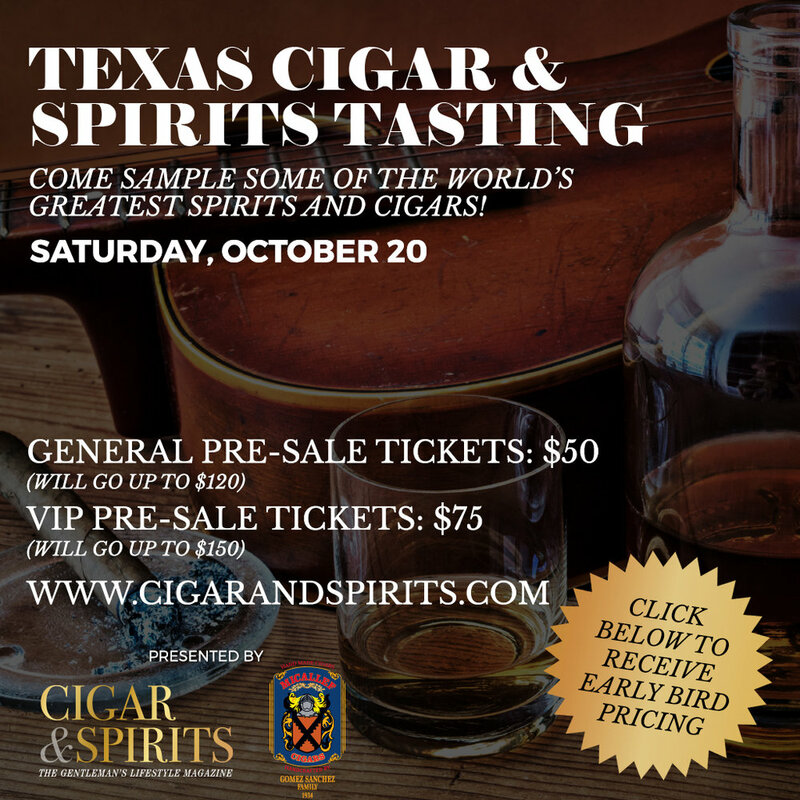 You won't want to miss out on Cigar & Spirits Magazine's Annual Texas Cigar & Spirits Tasting brought to you by Micallef Cigars! Here you will be able to sample some of the world's greatest spirits and take home hundreds of dollars worth of premium cigars while enjoying amazing food, live music, give aways and best of all, the camaraderie and friendly atmosphere that a great spirit and delicious smoke creates. Cigar & Spirits Magazine has been hosting this same event in Newport Beach, California for the past 8 years and now we're bringing the same event to the South. We have grown the West Coast Cigar & Spirits Tasting to over 80 top notch cigar & spirit brands which have included Rocky Patel, Arturo Fuente, Drew Estate, Altadis USA, JC Newman, Macallan, Patron, Zacapa, Johnnie Walker, Don Julio, among many others with over 1,000 attendees. Now we're looking forward to growing yet another successful event with all of you in Fort Worth, Texas! So join us for a night full of great smokes and samples from the best premium spirits around with new and old friends and a night you will never forget! A sneak peak of a few of the brands you can look forward to sampling include quality brands from around the world as well as a few located right in your back yard such as Acre Distillery, TX Whiskey, Panther City Distillers, Southwest Spirits, Micallef Cigars, Ketel One Vodka, Diplomatico Rum, Nolets Gin, Uncle Nearest Whiskey, Garrison Bros, Comissario Tequila, JC Newman- Diamond Crown, Hoyo De Monterrey, Miami Cigars, Alec Bradley and many more! General Admission will give you access to the event where you will sample some of the best spirits and take home hundreds of dollars worth of premium cigars from around the world. Click here for ticket sales! Join Micallef Cigars at Cigar Town for a quintessential experience you don't want to miss! Sample our complex flavor profiles of sundrenched leather, sweet peppers, and delicate oils in this delicious series of unique cigars! We'll also have live cigar rolling by a master roller! You won't want to miss this event!! Join Micallef Cigars at Hoboken Cigars for a quintessential experience you don't want to miss! Try our premium line of cigars, and grab a few for your friends this holiday season! Join Micallef Cigars for an event to remember at Havana Cigars in Atlanta, GA! Sample our fine, unique cigar line at our premier rolling event! Friday September 29th from 6pm-11pm - We are doing something we've never done before!! A LAUNCH Party - Micallef Cigars - We are the FIRST Shop in Mississippi to carry these fabulous Cigars!! So we will be having a Cuba to Cowtown themed party! Come wearing your best Fedora or 10 gallon, best dressed gets a box of Micallef's best!! We'll have bourbon, BBQ & brew!! So come out and have a great time!! Mr. Pedro F. Gómez was born on San Luis Pinar del Rio, Cuba on February 10, 1923. At age 11, he started working as an apprentice at a local factory. The following year, he moved to Havana where he started working at Becquer in Marianao. He later began working at Pita and Brothers Factory until 1947 when he began the fine art of handcrafting tobacco cigars at the H. Upmann Factory. He then continued working at The Corona Factory. In 1972, he moved to Palmas de Gran Canaria, Spain and continue working in different factories in Miami, Honduras, Nicaragua, Dominican Republic, and finally in Mexico. Mr. Gómez worked as a Plant and Production Manager in some of the most renowned cigars factories in the world and is recognized worldwide as a master of tobacco and as a fine harvester. His work has also been recognized in well-known magazines (Cigar Aficionado, amongst them) in the USA and Europe. Mr. Pedro F. Gómez died at 79 years of age in Mexico where he was still working at one of the most prestigious factories in Mexico and the world. Join Micallef Cigars for a Cut & Light event on September 1st at Hill Country Humidor from 3-7pm. A fine smoke and cigar story, with an intimate introduction of our Cigars! Familiarize yourself with the upcoming line of luxury, handcrafted Nicaraguan cigars and their unique, flavor profiles. It's a celebration! Join Micallef Cigars for a fine smoke and good time for Don Donato's birthday at Hoboken Cigars in NJ. We will be giving away our Micallef Cigars Humidor for raffle, in addition to other surprises! This is the event not to be missed! Special Event Alert!!! 🚨🚨🔜 Saturday August 26th , Mayweather Vs McGregor fight 🥊🥊 watch party at Top Notch Cigar & Whiskey Lounge. Reserve your Tables Early! We will have a Remy Martin Tasting, giving out free drinks. Plus Micallef Cigars and their Models will have an event with cigars specials all night long @micallefcigars. Come Enjoy Drinks and Cigars while watching the event. You can stay after the fight and party to the music by DJ Funkmaster Olly, @funkmastaolly Dress Code Required. $25.00 at the door this includes a free drink on us or a free house cigar you choose free!!!! We're thrilled to be working with The Toasted Foot on this last minute event! They were just too stoked about our cigars. We will be on hand cutting and lighting with killer specials and some Micallef swag. Entice your palate: Join Micallef Cigars for a Grand Tasting & Pairing with a Summer Estate Wines Andriana's Cuvée Cabernet Sauvigno at Cigar Room Davie on August 17th. A fine smoke and cigar story, with a free humidor giveaway raffle! Familiarize yourself with the upcoming line of luxury, handcrafted Nicaraguan cigars and their unique, flavor profiles.